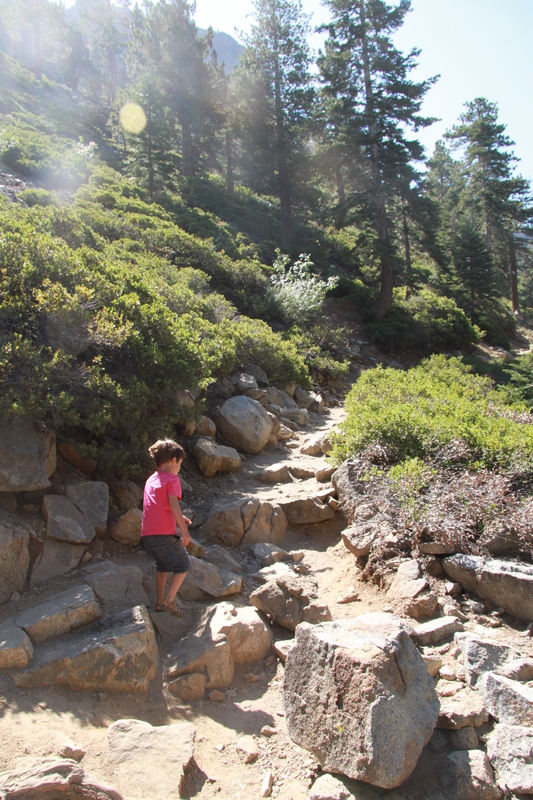 This is a perfect short but fun hike for small children. Park at the well-marked trail head on route 89 about half a mile north of Tahoe Pines and head west along the path. At first you’ll travel through shady forests along a flat path before the trail climbs gradually up the hill to the peak of the crag. There is some easy scrambling over stones at the top which our kids really enjoyed. The view from the summit is amazing and it only takes about twenty minutes to reach the top. Take the same trail down and back to the car. Highly recommended for reluctant hikers! This is a more challenging hike. Our four year old loved it and walked/climbed the whole thing with ease. Our intrepid two year old completed most of the hike under his own steam, although he wanted to be carried on the easier (more boring for him?) parts of the trail at the start and end. 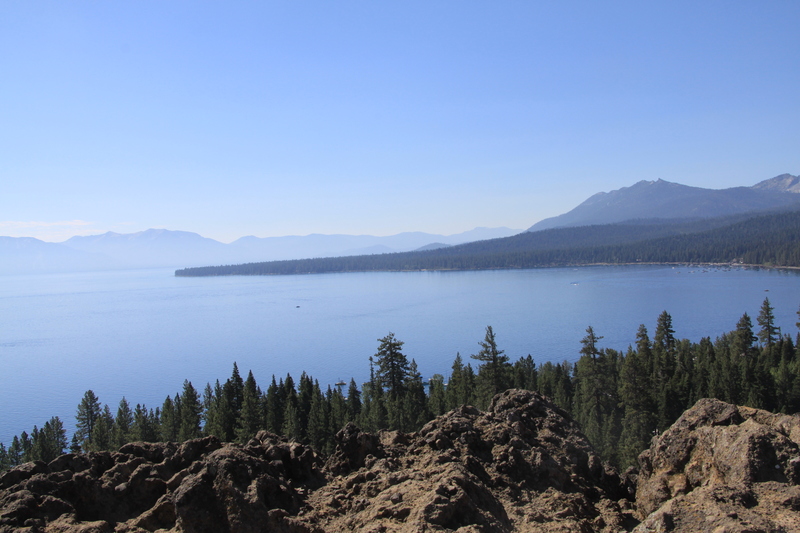 The hike isn’t too long—one mile each way from parking lot to lake—but it is rather steep and craggy in parts with large steps and boulders to be negotiated. 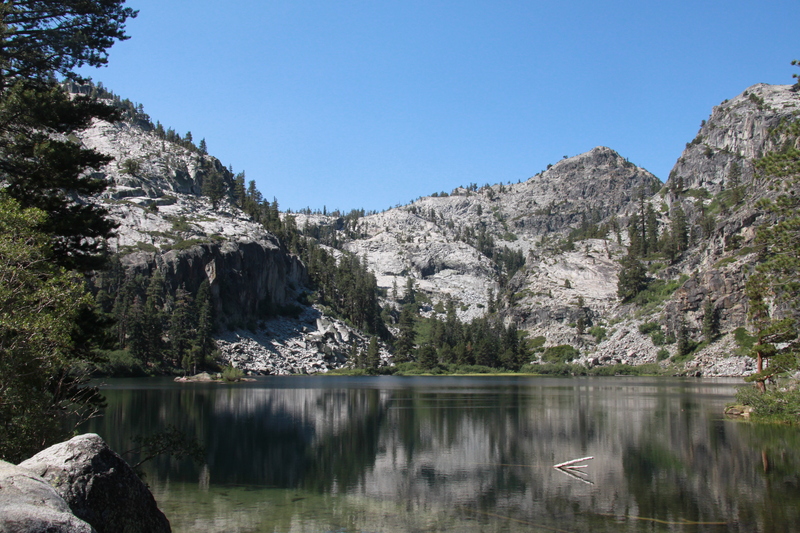 The destination is well worth the effort as the trail leads you up to beautiful Eagle Lake. This is a perfect spot for a picnic and paddle. 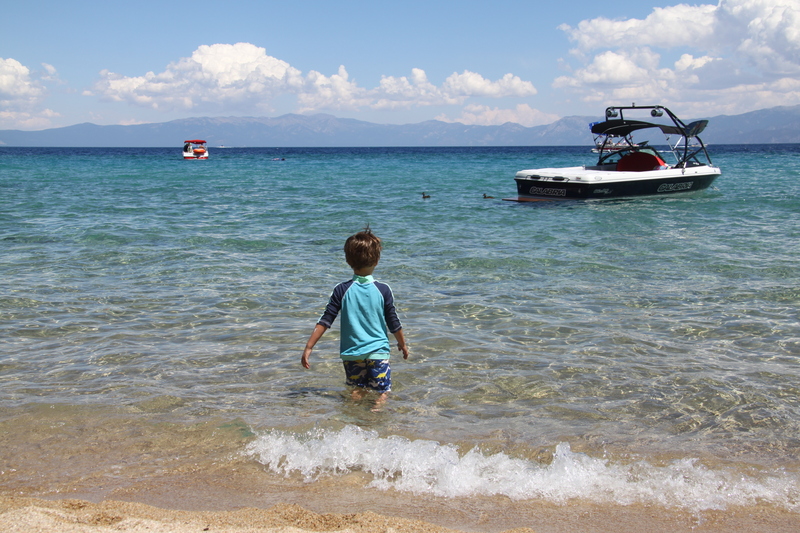 I strongly recommend taking water shoes, a towel and a change of clothes if your children like water as much as ours do. To find the trail head park in the Eagle Falls Picnic Area parking lot on route 89 about 9 miles north of South Lake Tahoe. Note that there is a parking fee so make sure to bring cash. You also need to fill in a wilderness permit before heading up the trail—find these by the map near the toilet block. Also note that parking here is limited and this is a very popular trail. We went early (arriving in the parking lot before 9.30am) which meant we could grab one of the much-coveted parking spots and enjoy the trail and the lake before the foot traffic became too heavy. This is another great hike for preschoolers. It’s an easy one mile each way from parking lot to the falls with only minimal (about 100 feet) elevation gain. Although the trail starts off wide and easy, it does get more challenging with rocky outcrops and boulders to negotiate. The drop off at the side of the cliff is quite steep and the bare rocky parts can be slippery, so you’ll want to keep little ones close by. 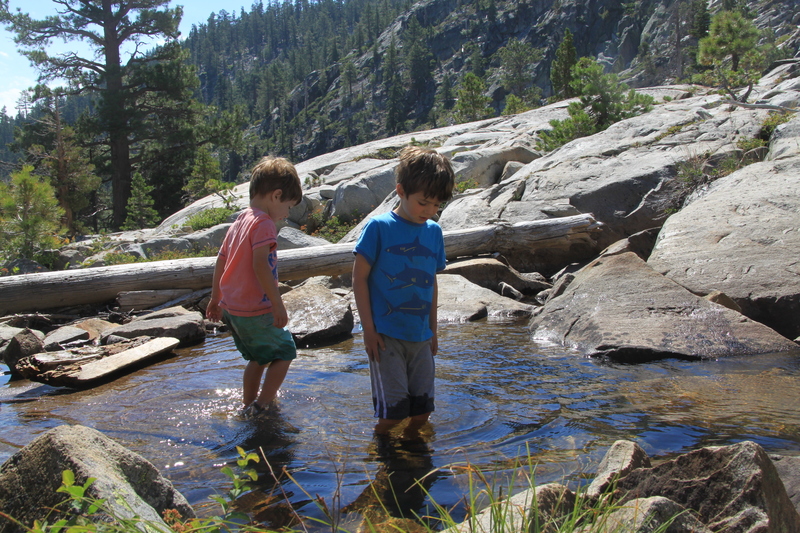 We hiked to the falls and then continued on a couple of hundred feet to a wonderful spot above the falls where the creek ran over granite rocks making lots of little pools where the kids could paddle. (If you do this make sure to go a safe distance upstream of the waterfall and keep a close eye on the kids). The view up there is incredible with mountains on one side and Cascade Lake on the other. To find this trail turn into the Bay View Campsite opposite the Inspiration Point parking lot on route 89 north of South Lake Tahoe. Drive to the end of the camp ground to find the free trail head parking. There’s no need to fill out a wilderness permit if you’re only hiking to the falls. Note however that like all popular Tahoe hikes the parking is limited and you’ll struggle to find a spot if you arrive after mid-morning. This is another gentle walk perfect for reluctant preschool hikers. Just head into the park and leave your car in the lot near the lodge. There is a day use fee at the park. The trail is a flat 2.1 miles that winds through the forest and then along the lakeshore and past America’s highest lighthouse. Allow plenty of time in the woods for free play and take a picnic to enjoy on Sugar Point’s relatively empty beaches. This is a lovely, scenic short hike of a little over a mile that ends on the glorious sandy beach at Calawee Cove. To access the trail, enter the state park and drive down to the beach parking lot. The path leaves from the furthest parking area. Take the shady light house trail up to the viewpoint and then return via the old lighthouse trail along the coast. The first part of the hike is fairly easy, but there is some scrambling along the cliff edge on the return leg – keep little ones close. Afterwards relax with a picnic on the beach. Note there are day use fees at D L Bliss and again there is very limited parking in the beach lot. If you arrive past 9.30am in high season you’re unlikely to find a spot.